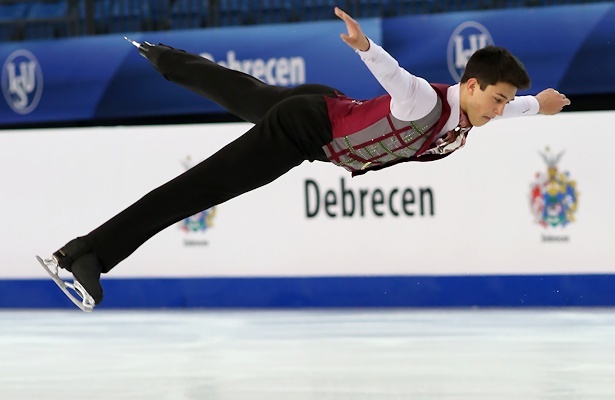 Daniel Samohin of Israel performs his Long Program at the 2016 World Junior Figure Skating Championships. When Daniel Samohin won the World Junior title last March, it was not only the first ever medal at Junior Worlds for Israel, but also the first ISU Championship title for the country. It was a great moment for Samohin, his coach and father Igor, and the whole Israeli team. Sitting in 9th place following a subpar short program, Samohin had nothing to lose. The 18-year-old nailed three quads (two toes and one Salchow) and one triple Axel to surge to first. Samohin is a powerful, flamboyant skater with huge jumps and he tries to sell his programs with story-telling themes as well as to entertain. Samohin junior takes part in choreographing his programs and likes to improvise a little bit during the performance. The athlete wants to continue working on his choreography and to skate “more grown up and beautifully” and also to improve the components score. Samohin hails from a true skating family. His father is his coach, his mother is a choreographer, his older brother competed internationally for Russia and Israel, but took a break to heal injuries. Samohin’s parents emigrated from Russia to Israel in 1996, before Daniel was born, however, there is not much work for skating coaches in Israel and so Igor Samohin and the older son, Stanislav, who was ten years old at the time, moved to the USA. There was not enough ice time. They even had to train on special roller skates that Igor Samohin designed himself. Little Daniel and his mother, a former rhythmic gymnast, stayed back in Israel until he was three and a half. Now the family lives in California. Samohin never tires of figure skating, although the whole family is involved in the sport. Being coached by his father is not a problem for Samohin. Igor Samohin, on the other hand, admits that it is sometimes hard to coach his own children. And so he did. Daniel Samohin competed at the novice level in the USA, but then decided to represent his country of birth, Israel, when he was 15 and a half years old. Now Samohin has set his eyes on new goals. He mastered the quad toe and Salchow and would like to add another quad to his repertoire. Samohin is a very active young man. In addition to skating and attending high school, he wants to launch his own clothing line together with his brother and a friend. Samohin, who was ranked 7th in his debut at the 2016 European Championships, will debut in the senior Grand Prix this fall and has been assigned to Skate Canada and to Cup of China.